In 2005, Amsterdam put up a giant city sign with two-meter-tall (~6.6 feet) letters that spell out I amsterdam. This sign is now the city’s most photographed icon, generating over 8,000 photos per day. The sculpture has been posted all over social media, attracting tourists and generating awareness of the city. If you search #iamsterdam on Instagram, there are over 1 million posts. That’s over 1 million mentions of Amsterdam on one social media platform that cost the city nothing, except for the installation of the sign. So why should you care about a giant sign in the Netherlands? You too can harness the power of C2C marketing and leverage social media sharing for your business using the I amsterdam model. User-generated content (photos, videos, and other content that consumers create and publish online) is one of the most effective ways to generate brand awareness and tap into a larger audience. One way to encourage customers to post content that promotes your brand is by creating a photo op that includes your logo. You don’t even need to invest thousands of dollars into a custom sculpture. A custom gobo can achieve the same effect and gives you the flexibility to move the sign and adjust its size depending on the desired outcome. Call attention to your restaurant with a custom gobo sign that puts your name and logo in lights. A projected sign on your building’s exterior will not only attract those passing by, it will also provide the perfect photo opp. Your customers can snap a shot of your sign and post it to social to share where they were dining with their friends and followers. 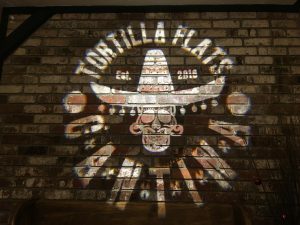 A custom gobo can also set the mood inside your eating establishment. Project your restaurant name just inside the entryway where customers wait for a table or behind the bar. 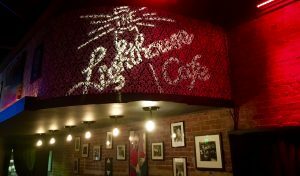 The Lighthouse Cafe in Hermosa Beach, Ca (the same jazz bar featured in the award-winning film La La Land) projects their name and logo above the stage so any photos of the band also include their branding. Already have a sign made of giant letters like I amsterdam? Decorate your sign for the season with a patterned gobo projection. 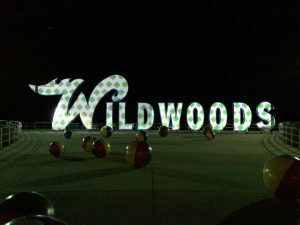 Wildwoods Amusement Park in New Jersey decorated their sign for the holidays with projected snowflake gobos. They easily switched to shamrocks in March for Saint Patty’s Day and to pastel flowers in the spring. People love taking photos at special events to share on social media. Keep this in mind and provide a special photo area with the name of your event or business. Create a glamorous backdrop with a custom gobo projection and uplighting for a full awards-show effect. 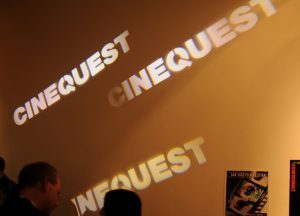 The Cinequest Film Festival blanketed an entire wall at their opening event with a custom gobo. Put the spotlight on your dance floor with a custom gobo projection. 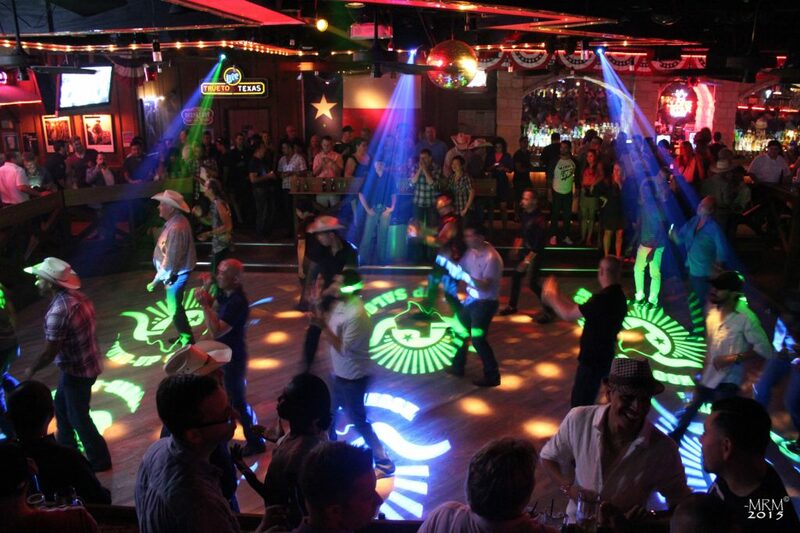 The Round-Up Saloon in Dallas, Texas projects their logo in rotating colors across the wooden dance floor where Texans ‘scoot their boots’ to country and western music. Spectators and dancers post their pics on social media of the country bar and dance hall. Recommended Projector: ECO Spot LED C60 for standard E-size gobos or the ECO Spot LED B90 for larger M-size gobos. Posted on February 28, 2018 by gobosour. This entry was posted in Marketing and tagged brand identity, corporate events, custom gobo, custom gobos, event decorating, event promotion, full-color gobos, gobo, marketing tools, social media marketing, user-generated content. Bookmark the permalink.